Barry McNamee, who scored the equaliser in the 1-1 draw with Limerick last month at Maginn Park, is City's top scorer with five goals. KENNY Shiels has called for a greater ruthlessness in front of goal from his misfiring Derry City side ahead of what he has billed as ‘one of the best football games in the league’. And having seemingly shored up a previously leaky defence in recent weeks with two clean sheets in succession, Shiels reckons it’s time his side start putting teams to bed. During the club’s recent stutter where they failed to win in seven attempts, the options that last season’s leading marksman, Rory Patterson provides have come to be missed more and more. Attacking midfielder, Barry McNamee is currently City’s top scorer with five goals and Shiels insists his side must find an attacking ‘formula’ which works going into tomorrow’s trip to Munster. If we can get through this period where we’ve four away games in five and we get three points, then we can build on that. Under Shiels’ watch Derry City boast an impressive record on the road having lost just four times in the league. Finn Harps (2-1), Dundalk (3-1) and Cork City (2-1 and 3-0) are the only teams to inflict a defeat on City on their travels since March 2016, which is an impressive record Shiels is hoping to keep intact this weekend. Saturday’s fixture is the second of five away matches Derry face this month and Shiels is desperate to extend the five game unbeaten run and close the gap on second placed Bray Wanderers who are just three points ahead going into Friday’s clash against Finn Harps in Ballybofey. “We’re looking for a European position,” said Shiels. “We’re three points off second. “If we can get through this period where we’ve four away games in five and we get three points, then we can build on that. 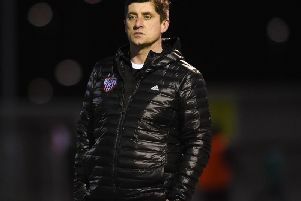 Shiels had predicted Limerick would emerge as potential title contenders at the start of the season but with the change in managers it appears to have hampered their progress of late. But the Derry boss still believes they are one of the better sides in the league. “Limerick are a good team and I like the way they play. It’s probably the best football game in the league at the moment - Limerick v. Derry City. They’re good, technical games and these are the ones they should be putting on the television I think. “I still say they are one of the best teams in the league in terms of what they produce and the entertainment level.